A glimpse of the near future, for those of us working in marketing communication? Sapient recently sponsored a national online survey to gain insights into what marketers want from their advertising and marketing agencies in the next 12 months. The survey polled more than 200 chief marketing officers (CMOs) and senior marketing professionals. I. Traditional advertising agencies are now at risk of losing their clients. II. Agencies should acquire Social Media expertise. For the full article: Brand Marketers aim to receive digital expertise from their advertising and marketing agencies. Related article: Sapient’s Top 10 Wish List for Agencies of the Future, based on their survey. …is a long but interesting read with some new concepts like “ambient awareness”, which is “very much like being physically near someone and picking up on his mood through the little things he does — body language, sighs, stray comments — out of the corner of your eye.”, describing the online experience of how we absorb bits and blurbs of ‘status updates’ (like those from Facebook, MSN, or Twitter) posted by our social network. Also on IHT as “Web Ushers in an Age of Ambient Intimacy” with an analysis on PSFK. Today I attended a presentation arranged by AmCham with Asia Online as Guest Speaker. Once over the initial shock of the title (Is Machine Translation Ready for Real-world Use? ), I found the subject matter fascinating and wondered why it had not struck me sooner? With approximately one billion online, many of whom are comfortable with the English language, what of the next billion? The ‘next generation’ will want (and many will only be able) to interact with the web in their own language. Dion Wiggins, CEO of Asia Online, explained how currently only 12% of all web pages are in Asian languages (mostly split between Chinese and Japanese – with Thai making up less than 0.03%). Although much was made about making technology available to the developing world, he went on (especially the Nicholas Negroponte-fronted project One Laptop per Child) little progress had been made in making the vast majority of the existing, valuable content available in anything but the English language. In response, his company is “innovating software translation technology to deliver far more accurate results and to support many language combinations…to translate huge quantities of valuable content and make that freely available in local languages.” They are well aware of the idioms and nuances each language possesses and as such the software requires vast amounts of data (corpus) in original and translated versions from which it can learn. Assuming they are successful, the value of existing content and the ability to create new pages instantly available in multiple languages will be of huge potential to the current and ‘next billion’ Internet users. A couple of months back I had the chance to meet with Sean Leow in a small café in Shanghai, one of the co-founders of the social networking site ‘Neocha’, which Pew Internet dubbed as China’s MySpace for the creative-types, as mentioned in the previous introductory post. I was first introduced to Neocha.com through our trend scout in Shanghai through her article on ‘Online Home for Indie Culture in China‘ on our Asia Scout Network blog. Sean is a half-Chinese, half-American who has been living and working in China for the past four years. After growing up in San Francisco’s Bay Area and graduating from Duke University, Sean moved to China, studying and working in four Chinese cities along the way. Chatting casually over coffee, Sean talks about his exposure to Japanese-influenced youth subcultures in China and the one-day Neocha launch event which attracted 8,000 to 10,000 young people through digital means and word-of-mouth while taking us through Neocha’s webzine <Blow-Up>. He contends that the best way to connect with young people is through brand engagement. This edited video clip is a short collection of the highlights of the interview. 1. What do you find interesting about China’s digital media landscape? One thing that I find interesting is digital webzines. That’s something that some people say is a failure in other countries – releasing webzines with flash online. In China though, it has been pretty successful coz it’s so hard to get a publishing license here, that if you can release it online for free, people are demanding that kind of content – new content that speaks to them so much more than the stuff that is shown on state-run media. 2. Why create another online community platform in China? The simple reason was that there was none targeted specifically at the creative communities in China. I’ve spent a lot of time going all over China. I’ve been here for four and a half years and I see really interesting content being created whether it’s music or photography or design. And when I go somewhere like Beijing, I’ll meet someone like “oh, I know someone who’s doing something similar in Shanghai” and I kept running into those situations until I’m thinking where is the aggregation point in this. Is this being done online or offline? What I found was that it wasn’t really existing, it was very scattered groups and I thought there was an opportunity to bring them together. So I went to some of my Chinese friends who are even more knowledgeable on this demographic – guys who are musicians, those who actually live the life. They’re like no, there isn’t a website that caters to us, that speak the same language. So, on the one hand we saw that there was a need for an aggregator. On the other hand, I grew up in Silicon Valley so all my friends and family were always involved with the internet. Now I think the tools do exist that we can allow these people to both promote themselves, and at the same time collaborate with other people who are interested in this content. One thing that we do that’s a bit different from other online communities is that we do have a big focus on offline events like that big event I showed. 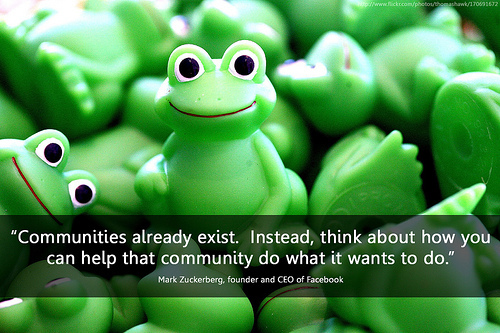 Our communities are already set up like that. To do a concert with them is not difficult because they’re already doing concerts. To do a photography exhibit with our photographers is not difficult because they’re already doing exhibits. And I also believe any successful community has an element where people can meet and talk, to reinforce the friends and the connections that you make online and offline. We’ve already done four or five offline events. We’re thinking of doing something on a monthly basis, on a smaller scale. This (launch event) is like once a year type of thing. Right now we only have the resources to handle Shanghai, but we’d also like to be in Beijing, Hangzhou, and to a lesser extent the other cities. 3. So how did you “get the ball rolling” and start attracting young people to the site and to the event? In China, young people don’t use email that much. You think of viral campaigns that you do in the US, a lot of that’s through email. In China, you can definitely use email as a tool, but it’s definitely not used as widely as the US, except among white collar workers who use it for work. I find with the young generation it’s almost all IM, in the big cities it would MSN or otherwise QQ, and through cell phone. We also send out emails. I mean you send out 3,000 emails you’re bound to get somebody that’s going to respond to it and not think it’s spam. The other way that we did it was just contacting everybody that we knew that we considered, we’d call them ‘mavens’, guess you could say that, people who we think are influential, who have fans, networks that they can reach out to. You get those people on it and you get them to bring the people that they know. And then on top of that was the big event that we did. I find the best way to market online is actually through BBS’s, BBS forums. That’s traditionally how these online communities have been structured and in China it’s still and extremely popular form of communication. I think that’s moving more to the blog/space type of set up that we have. I guess that’s why we didn’t create a BBS for creative communities. But BBS is still very powerful for spreading your message. 4. Do you think there’s any social or cultural link between these creative communities and the non-creative types of people? Or are they completely separate from each other? I’m not going to say that [the creative community] is huge because I don’t think it is yet. But it’s different from other niche subcultures that you see, because I think these people are having more and more influence over mainstream culture, and I think in 3-5 years they will be tremendously influential. That’s the hypothesis behind what we’re doing. We think they’re going to be extremely influential – these people are about 17 to about 30 years-old and they really represent the new generation of Chinese kids which is they’re very proud of being Chinese, and at the same time they’re part of the world community and that they have innovative, interesting content. They’re not just the China of old, made-in-China products, they want to turn that around and say ‘look we’ve got some interesting stuff too’. And it’s also the same as the motive by the government because for so long, China’s at a cultural deficit, they’ve been importing movies, music, art, and they haven’t been exporting anything. So they want to reverse that cultural deficit and start creating their own stuff that they can start using as ‘soft power’ to export to the rest of the world, like music. So I think it’s a perfect storm between these people coming of age, having the means to do it because they don’t have to worry about day-to-day existence, and basically being supported by the government and other people, not just their parents, but other people that they know. 5. How have the young people influenced the mainstream? Have you any examples? Part of it you can just see by walking in this area (Xinle Lu). This is kind of like the hip area of Shanghai. You go into the boutique shops here and you see the clothes and, the T-shirt revolution that’s going in China as everywhere else in the world. There’s a lot of these designers like ‘The Thing’. You see their influences and their designs on everyday people who are walking the streets. 6. What’s the general attitude of the young Chinese people that you meet? They’re sick of old media. They’re also sick of the canto-pop star. It’s difficult to put a label on them. They’re interested in finding ways to take independent culture and making it more influential on the mainstream. They’re not rebellious in the way that you would think of Americans or Europeans are rebellious, like try to run away from home. They still have that kind of filial piety to their parents. Some people’s parents are more accepting of what they’re trying to do and some people aren’t. They’re not interested in politics. We have over a hundred blogs which I read half of everyday and no one’s ever really talked about politics. They’re talking about a new CD, posting an illustration that they did. There are different stratums of users. Our strategy is we are going after people who are already creating content. But they don’t have a good place to post it. In that way they already have the content – the pictures, the stories, the music. We think that’s the best way to grow the website fast because people have stuff to look at and interact with. And then at the same time, we’re trying to work on strategies to bring in more regular people who are interested in these creative communities, but isn’t necessarily the members who are making this stuff. They’re more interested in maybe reading about it or maybe commenting on it. 7. What’s the best way to connect with young people? I really think digital is the best way to connect to young people. Not only are they spending time there and you can target them demographically, but also you can engage them so much more than you can with just an advertisement on TV. You can get them to in there and write a comment. You can get them to go in there and to vote for someone. You can get in there and download a template for a t-shirt and design the next version of the Adidas t-shirt. They engage with your brand that way – It’s not just I saw it and that’s great. They’re actually engaging with it….The cost isn’t that much to sponsor, but the return they get is that get all of these influential people all engaged with their brands for a certain amount of time. Maybe it’s a buzzword, but I think that brand engagement is a pretty important part of the digital strategy. I think Alok hit the nail on the head with the question “MySpace or Facebook or should we even care?“. The basic reason anyone joins a social networking today is to be part of a community that one identifies with. Only 3 years ago, no one really had much of a choice in selecting our preferred social networking platforms. Take me for example… I was invited into hi5 (the main social networking site in Thailand right now) a couple of years ago. Back then, just the simple fact that I connect with friends from grade school and revel at my rising popularity as I added more and more friends to my network already thrilled me. I remained on hi5 because all my friends were there. Period. It was the only network had gained critical mass among Thais. Of course you’d want to be where everyone else is, right? Three years ago, the answer would have been a resounding yes, but today, it might be a NO. More accurately, the answer would depend on who ‘everyone else’ is, what their profiles are, and most importantly, if you are actually engaging together in similar activities or interests. Yes, it’s great find your long lost friends and show how popular you are, but the excitement over that particular feature is long over (remember how you felt when you received your first ever email, then think how you feel about emails now). Ultimately, for any social network to keep itself alive beyond the initial hype (beyond the phase where everyone invites everyone to be their friends), the social network has to prove itself useful for either a person’s career, hobbies, or social life offline. In other words, it has to provide a strong unifying PURPOSE for a community of people who actually interact with each other for more than the sake of interacting just because they are a bit bored that day. Enabling this is the fact that the technology for developing these social networks has likely become a commodity these days, because of the open-source movement, and because of user-friendly platforms like Ning which allows non-techies to create their own social networking sites (Ning now has over 100,000 user-created sites). That’s where I thought “niche social networks” should enter and hold value by being really quick to use (functional), while being extremely relevant and fiercely exclusive (e.g. offering services specific to the relevant crowd). As fragmented it would turn the social networking scene, it would serve the long tail, catering to the smaller but passionate group of users. For instance, Estee of blogbuzz.tv recently pinged me about a social networking site for professional women cleverly called Damsels in Success. While I only took a superficial look at it, I was more intrigued by how social networking sites like these weren’t about having huge populations of users (quantitative), but rather solid relevance to specific mobs of interests (qualitative). … the value lies in how you aren’t in a huge community of strangers, but of close friends you can actually do stuff with. It’s probably one reason why, although I have 3 times more friends on Hi5 than on Facebook, I can’t remember the last time I logged on to hi5, let alone my password (sorry hi5’ers). Brands would be missing the point to focus only on the numbers. Business and branding potential lie as much in the richness, as in the reach of a social network. Fact fest for planners with a predilection for statistical summaries. It isn’t a relaxing read for the beach (tough luck, Western bloggers, the good weather’s on its way to Asia now). 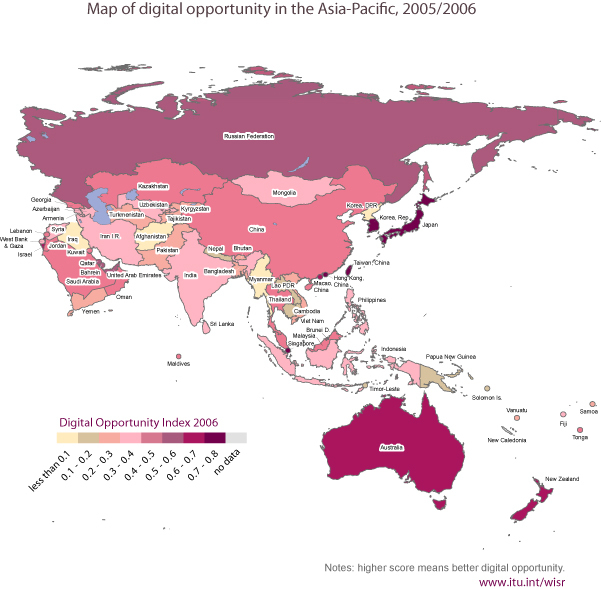 But the world-at-a-glance statistics and maps offer authoritative back-up for anyone working on multi-market digital strategies: “If you don’t like my numbers, go argue with the United Nations”. While we’re on statistics, it’s self-evident that the wealthiest nations have the highest take-up of broadband. 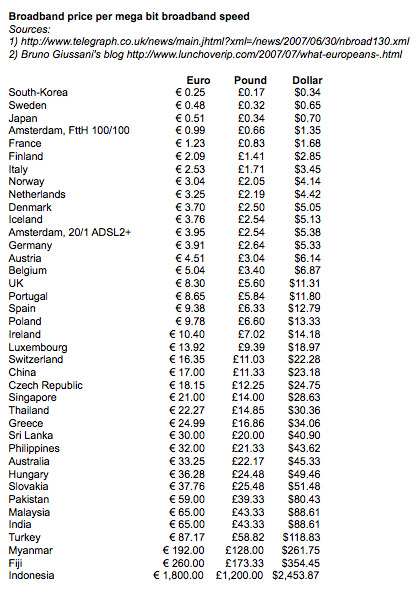 So what sense does it make to charge the highest subscription charges in markets where the public can least afford it? MuniWireless.com posted this piece a couple of months ago.